The TPFAS pressure sensor has a small size flush diaphragm which allows the use of a smaller size G1/4 (1/4 BSP) or M10 x 1 male thread for fitting where there is limited room or access to the process measurement point. The TPFAS is available in ranges from 25bar/350psi up to 600bar/9000psi, and with a choice of voltage or 4-20mA current loop outputs. 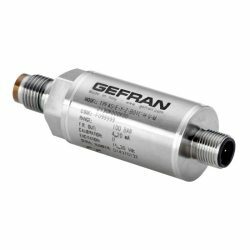 The Gefran TPFAS series flush diaphragm pressure transmitters are based on bonded strain gauge on stainless steel technology. The TPFAS has a strong flush diaphragm which is made from 17-4 PH stainless steel, The TPFAS is particularly suitable for pressure measurement where the media has a high viscosity such as thick fluids, oils, rubber, pulps and chemical products, and where a small size diaphragm is required without surrounding process connection. The high thickness of the diaphragm makes the product very reliable and suitable for heavy industrial applications. The internal state of the art digital electronics allows a wide range of current and voltage signal outputs, as well as the innovative “Digital Autozero” function that is able to perform an quick and easy automatic zero adjustment via touching the sensor with a magnetic pen or by short circuiting two pins on the electrical connector. 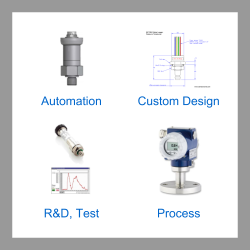 Please select the options you require for the TPFAS Miniature Flush Diaphragm Pressure Sensor in your application and request a quote. Send us your enquiry for TPFAS Miniature Flush Diaphragm Pressure Sensor to get assistance with this product type.